If you’re anything like me, constantly juggling a medley of applications across a sea of computer screens, it’s all too easy to press the wrong things in the wrong program. I find one recurring keyboard calamity is accidentally hitting Cmd+Q when in Lightroom, causing it to close. Sometimes this is because I was trying to Cmd+Tab to another program; sometimes this was because I was looking at a different screen and I was trying to close another application. Unfortunately unlike many other programs, there’s no ‘Are you sure you want to close?’ option that pops up in Lightroom. So I can be working away, accidentally press a key, and – pop – Lightroom vanishes. And then it takes an age to re-open because my Mac is ancient and creaky. Okay, so it’s hardly the greatest technological difficulty man has ever encountered – but it was annoying me, and I wanted to fix it. 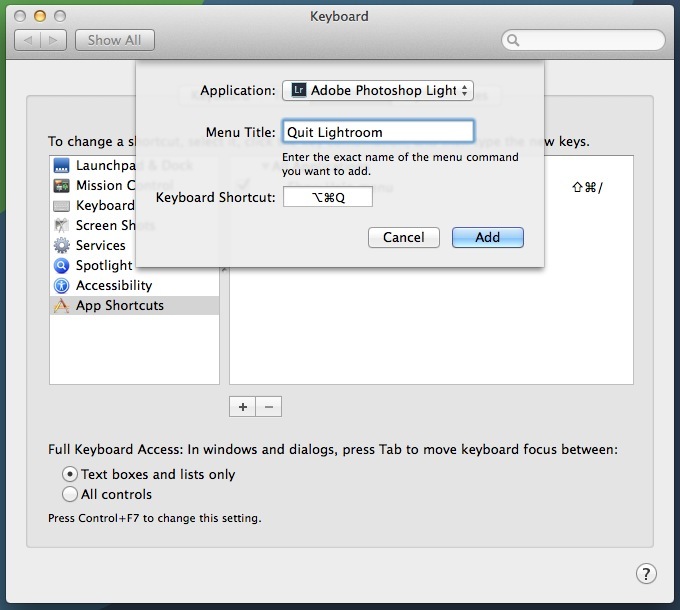 This magically disables the existing Cmd+Q shortcut in Lightroom. It takes a little more effort to close Lightroom now, but it means I can keyboard-mash a little more safely now!